The leaders of the most successful resistance to oil and gas as development in Australia packed out Pulborough Village Hall and a Brighton venue, at the start of a UK tour of their film the Bentley Effect. 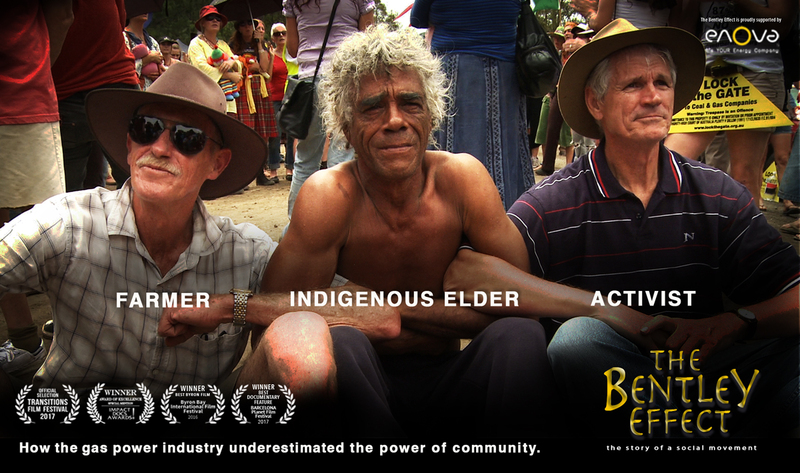 The documentary shows what a small rural community in the Northern Rivers region of New South Wales were able to do. Their protests led to the Government recalling the license. Experienced activists and community leaders Ian Gaillard and Simon Clough and filmmaker Brendan Shoebridge paid tribute to their community. They crowdfunded their trip to show their award-winning film that shows how they took on the energy giants and won. Following the successful events in Sussex they encouraged those present to take non-violent direct action too. Several exploratory sites exist in the south of England including Broadford Bridge at Adversane near Billingshurst, Horse Hill in Surrey, Markwell’s Wood and Lidsey near Bognor Regis, placing much of the Weald under threat. First of all, we’d like to say a huge thank you to everyone who came along to our Public Meeting in Pulborough on Sunday 30th April. What a fantastic turn out – well over 150 people, concerned about what’s happening to their local area. The speakers gave very clear presentations drawing attention to a range of issues. Many of you were surprised to learn that the Broadford Bridge site is located near a fault, a gap in the ground, which Dr Roger Smith from the Campaign for the Protection of Rural England, CPRE, explained could mean that any liquids/chemicals could transfer, through the system of faults to the public water supply via the River Arun. Professor David Smythe outlined not only the geology but the flawed economics, explaining that many of the US companies are in debt, with the onshore oil and gas companies representing nothing but a massive Ponzi scheme. See his ‘Ten Questions to Ask KOGL About Broadford Bridge’ via the link below. Please pass it on to others interested in the issues who were unable to attend the meeting. See the excellent Drill Or Drop report on the meeting. Including links to David Smyth’s “Ten questions to ask KOGL”. And on our response to the UKOG Letter that was delivered to the event and to local residents two days before saying we were ‘scaremongering’. 1. What permission was given for – this has substantially changed to include new processes not in the original application, such as acidisation and nitrogen lifting. We argue that WSCC should demand a new planning application involving public consultation. Chemical use is even greater in acidisation than in hydraulic fracking. Solid and liquid waste will be toxic, highly saline and radioactive, a risk to groundwater, surface water and soil should accidents occur. The EA Midlands office stated that there are no suitable disposal facilities in southern England. The risk of spills and other accidents. Wells may be acidised repeatedly and there is little research on the subject of repeated acidisation, the cumulative effect on our environment and human health. Lack of transparency – e.g. location of “disposal facility” and information limited on transport, cumulative impacts of chemical usage. Absence of discussion of these issues in the Environmental Statement (ES) originally submitted by Celtique Energie. 3. The lack of public consultation about these new plans. There has been no information session provided by WSCC or KOGL. There was a display held in Billingshurst in 2012 before Celtique Energie applied for permission BUT nothing has been said about these new and very different plans. 4. Lack of effective monitoring programme for air, water, soil or health of people and livestock. Without such baseline monitoring how will people know how such a proposed drilling operation is affecting them? One another note, we hope to see many of you at the screening of The Bentley Effect, on Friday 12th May, 7pm start at Pulborough Village Hall again. When the coal seam gas industry staked a claim on the Northern Rivers shire of Australia, alarm bells rang out. A critical mass of people from all walks of life – farmers, landowners, mums, dads, activists, scientists – organised themselves to rally against the unconventional gas invasion. Filmed over five years, The Bentley Effect documents the highs and lows of the battle to keep a unique part of Australia gasfield-free. This timely story of a community’s heroic stand shows how strategic direct action and peaceful protest from a committed community can overcome industrial might and political short-sightedness. Keep Billingshurst Frack Free are determined not to let this beautiful area become industrialized by fossil fuel extraction. If you, like us, are concerned please come along and give your support to us at the Adversane Crossroads, outside the Blacksmith Arms between 2pm and 4pm this Saturday. Together we, as locals, need to have our questions answered.